Fast forward twenty years, and Mika played a solo concert at Cave 12 in Geneva. It may even have been his last concert, I don’t know. (Back in 2009, I saw one of the last ever Pan Sonic concerts in Vienna.) He began the evening with some quietly spoken, oddly touching words to the audience: “I’ve played many concerts, so I hope we can make some music tonight.” Those were the only words he spoke all evening, otherwise choosing to communicate through his extensive setup of electronic equipment. 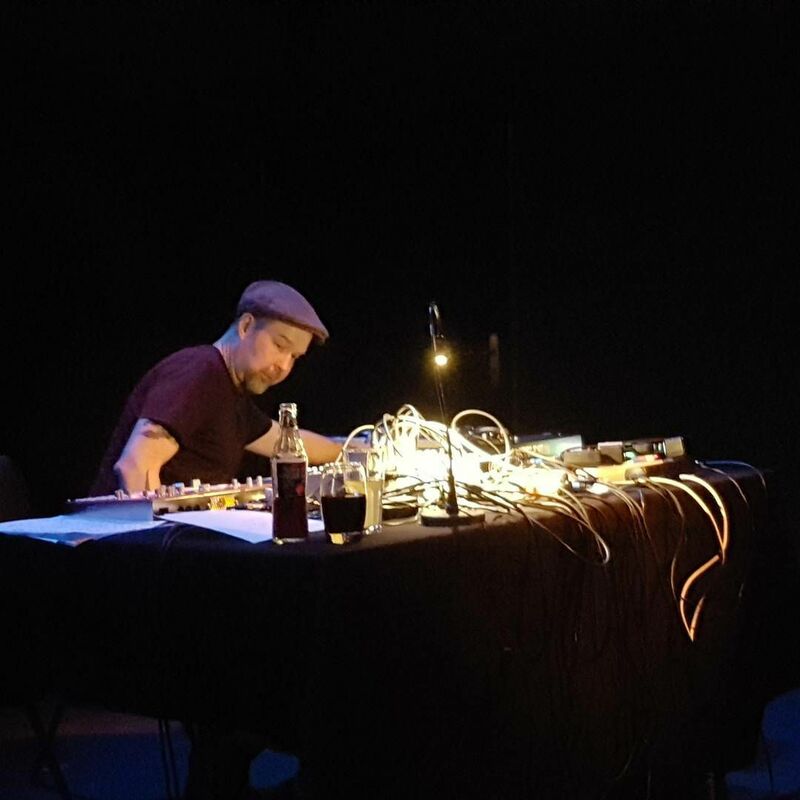 I’m no techie, but even I could tell that Vainio had not brought any computers with him, preferring instead a modular synth setup festooned with dials and cables. It was an excellent performance, with monstrously heavy passages punctuated by moments of deeply felt silence. Mika seemed to be using some kind of theremin-like device to trigger certain sounds with movements of his hand, bringing forth glitchy ambient passages amid waves of juddering noise. The fine PA at Cave 12 was more than capable of dealing with everything Vainio put through it, delivering a crystalline sound that did full justice to the remorseless intensity of the music. Sitting at a table bathed in white light, a flat cap perched incongruously on his head, Vainio was an amiable yet unassuming onstage presence. He gave little away until the very end of the performance, when he punched the air in evident satisfaction at the livid maelstrom of sound he had created. It was a gesture typical of the man, his apparent diffidence belied by the sheer enjoyment of music-making. He will be greatly missed. This entry was posted in Geneva, Live and tagged Geneva, mika vainio, pan sonic by viennesewaltz. Bookmark the permalink. Just found your article now… (19.3.2018) Yeah! So cool to know someone in the audience was deeply touch by his performance. Thank’s for your words, and yes it was his last concert. By bringing him from the hotel to cave12, I can tell you he really wanted to do this live!